Previously sold at Sotheby's Hong Kong, 20 November 1984, lot 498. 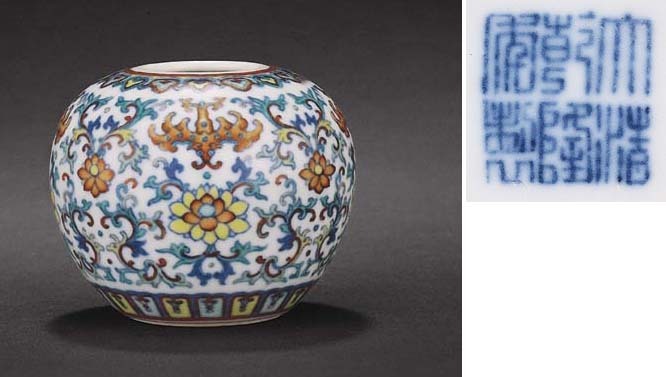 A doucai waterpot of this design is illustrated by J. Ayers, The Baur Collection, vol. 4, Geneva, 1974, pl. A571; and another from the collection of Mr. And Mrs. Albert Nipon of Gladwyne, Pennsylvania, was included in the exhibition Qing Mark and Period Monochromes and Enamelled Wares, Messrs. S. Marchant & Son, London, 1981, illustrated in the Catalogue, no. 49. Two others were sold in these Rooms, on 1 October 1991, lot 865, and on 29 September 1992, lot 565.